If there were concerns that PNG would drop their heads having fallen behind, a volley kick from mid-air cleared the pack running back into the goal-square, registering the Mozzies first goal and giving them hope. 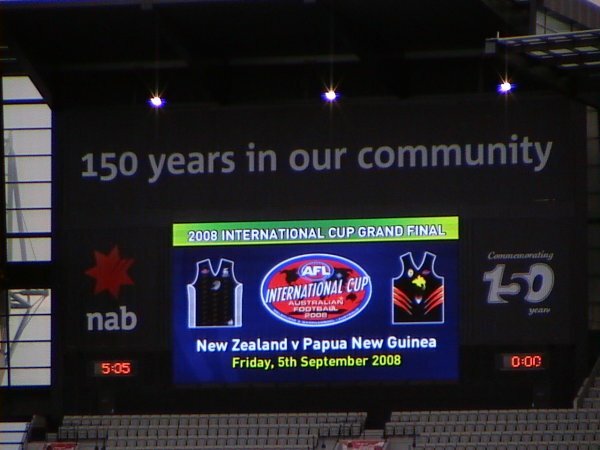 The Papuans kicked another but it was sandwiched between two New Zealand goals, including one to key forward and tournament leading goalkicker Richard Bradley. At half-time it was NZ 5.3 (33) to PNG 2.5 (17), the two time runners-up hanging in there and starting to get a clear running advantage over the Kiwis who already looked to be slowing up, but held a valuable lead in a match with only 17 minutes quarters, no time on (like the other IC08 games). The PNG advantage became very clear in the third, peppering the goals with near misses, often from gettable chances. The question was whether it was a dominance that would remain or whether they were burning their window of opportunity. Finally PNG goaled to close the gap to just six points and they had all the momentum. But New Zealand responded with a point from a long bomb from Doran and a goal to 2005 star James Bowden from long range after a juggling mark. A late PNG goal made the margin just six points once again at the last break and guaranteed an exciting finale. Tall youngster Amua Pirika, already looking dangerous, burst into life. Veteran Overa Gibson was back shoring up the PNG defence and his protege was given a key roll up forward. The 190cm (6'3") 17 year old has looked like a promising target for the future, but he thrust himself into the present, marking from a series of good passes, leading too fast for his opponent. Pirika's is an interesting story that we might delve into later, and on this night he was crucial for the Mosquitoes. He was looking unstoppable but wasted several opportunities and again it appeared the Mozzies might let the International Cup slip through their grasp. But weight of numbers told out, and Pirika and PNG began to kick goals amongst the behinds and it was becoming obvious that the reigning champs were in trouble. But as would be expected from a class team they responded with renewed urgency and had several forward thrusts, only to be denied by PNG having more numbers behind the ball. This was a startling situation and at first thought it appeared the Mozzies had put extra men back to fill the hole in front of New Zealand's dangerous forwards. But in fact it was more a case that the Kiwis forwards had been sucked up the ground chasing kicks, and their men had stayed back - the New Zealand structure, so important and impressive for several years, had broken down, even if only briefly. The teams line up for their anthems. Despite the pressure of the moment PNG's Donald Barry was laconic as he lay the ball across his boot to add another, and New Zealand looked gone as they lost the lead, and then had it blow out to eight points. More forward sorties by the Falcons were again marked by PNG's men filling space and any New Zealand supporters watching must have been distraught at the wasted chances. Bradley marked and goaled to bring it back to two points with around five minutes left and the centre clearance would be crucial. Papua New Guinea won the clearance and a desperate few minutes was spent battling for clear possession in their forward line. New Zealand had a couple more half-chances to go inside 50, but couldn't take them, then PNG ran the ball forward. Pirika marked again and the game was theirs. The siren sounded and the jubilant Mozzies swarmed over the ground. 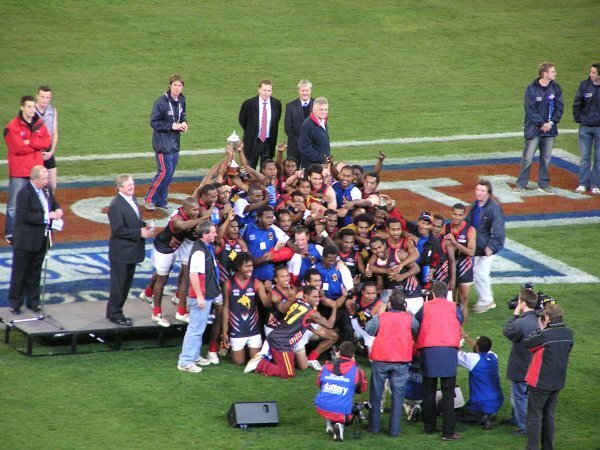 Amid the celebrations Pirika took time over his kick, from around 30m out on a very tight angle, and duly slotted his most difficult kick of the match, a beautiful check-side that curled through accompanied by a roar of approval from the growing crowd arriving for the subsequent AFL match between Hawthorn and the Western Bulldogs. The cake now had its icing. 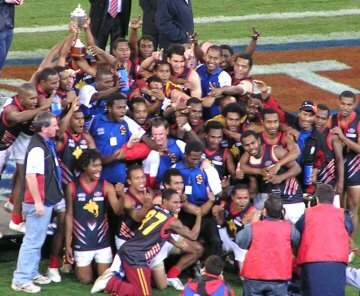 Papua New Guinea had finally broken the hoodoo and celebrated with a lap of the oval. Kevin Sheedy was on hand to award them the Cup, and the happy scenes continued in the changerooms afterwards, tinged with a sense of sadness as Gibson and several others retired from international footy. Congratulations to PNG for their deserved win and commiserations to New Zealand - gallant in a narrow defeat. 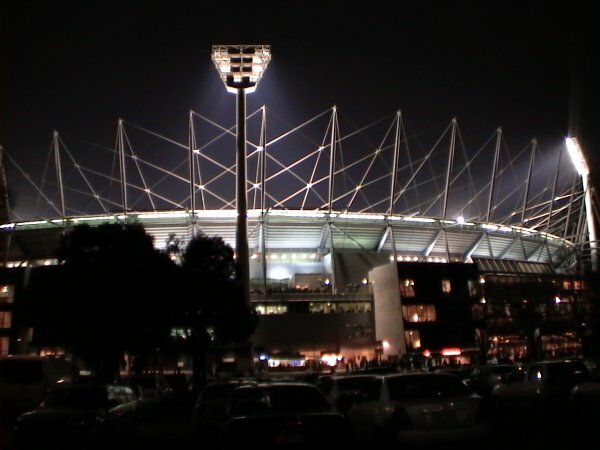 The MCG aglow (taken after the match). 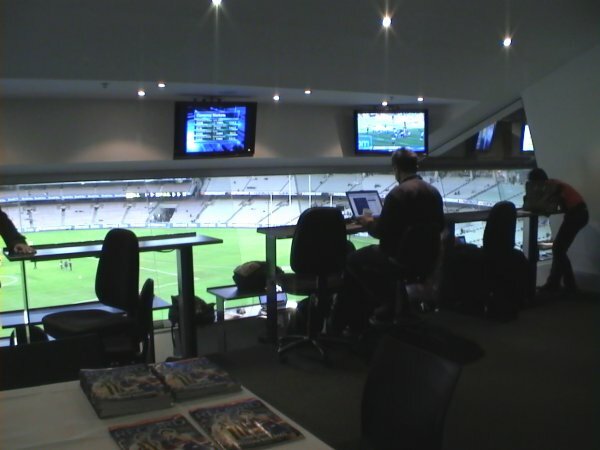 The print media room was a little light on journalists at the start of the match. The members stood for the anthems. The Kiwis did a lap to thank their supporters. Players enjoy the Cup and their medals in the change-rooms. I saw most of the IC Final, and was pleasantly surprised at the quality of play. 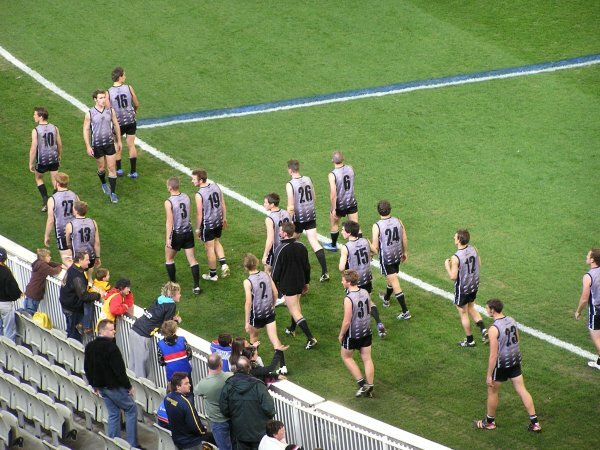 Both teams did make errors as can be expected, but few that are not made by the AFL professionals. Both teams seem to be, like the AFL, over doing the hand ball, although they probably did kick it more often in short passing. 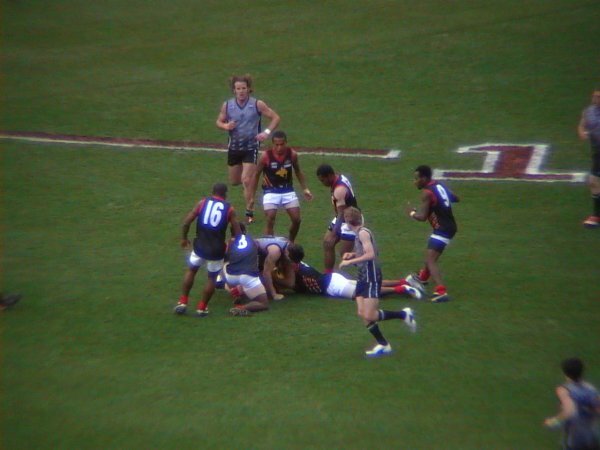 One thing the coaches should be training them is not to turn their back on the mark when kicking for goal, while the "footy smarts" aren't there yet, it could cost a goal if the man on the mark backed away to make it seem as if the player kicking has further to run up, then get the ball touched or grabbed straight from the kick as the defender runs back to the mark. To be quite honest, I found the IC final, (and even some of the prelim games), much better to watch than the Hawks,Dogs game. I think our "Professionals" could learn a few things about how to play the game from the international. Interesting how you mention PNG lacking "footy smarts", especially your reference to players turning their back on the mark. Watching the South Africa vs Ireland game yesterday, I noticed that the South Africans would almost always run backwards to take their kick, after a mark (for those unfamiliar with footy, this is desirable). Perhaps the result of a greater AFL presence in the country? 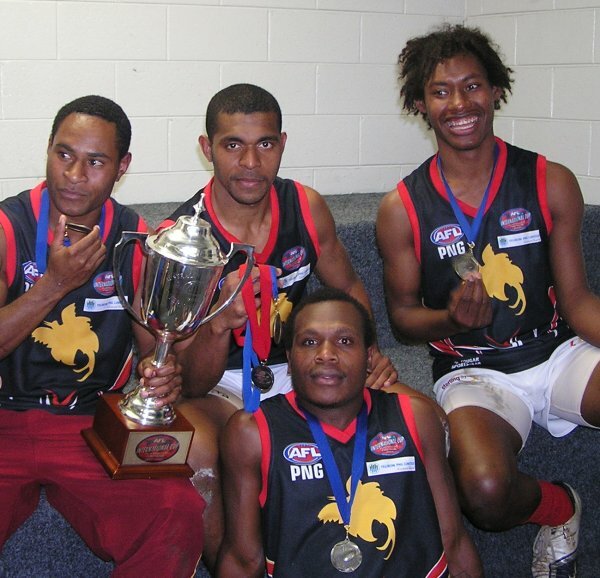 Footy has been played in PNG for decades with well established leagues/juniors. Its only been played in Sth Africa the last year or so. PNG play the more instinctive footy and seem to have reasonably good 'footy smarts'. Sth Africa though were coached by Jason McCartney and seemed very well drilled in the one-percenters including running back from a mark. year (roughly a decade), but the point about coaching is valid. tactics to modern AFL sides. there might be a bit to that. Sounds like a few of us are onto the same idea then - I'm planning on doing a bit of a think piece about rule interpretation and playing styles once the dust settles on the Cup. There's definitely a divergence and is in part the cause of a lot of dissatisfaction with umpiring. I'd have to agree with BomberMike, besides the "Buddy" factor, I found the PNG vs NZ final to be more entertaining than the Hawks vs Dogs. The passion that was on display was watered down only by a little bit of "professionalism" from NZ and some confusing umpiring decisions. The few people that were there early were getting right into it, many of them were still suprised that footy is played internationally and not just by expats and by the quality of footy on display. Although the AFL has improved its exposure through its website, realistically it sill has a long way to go in making this tournament work. It depends on your definition of making the tournament work - ask just about any country official or player and they'll say it already works. 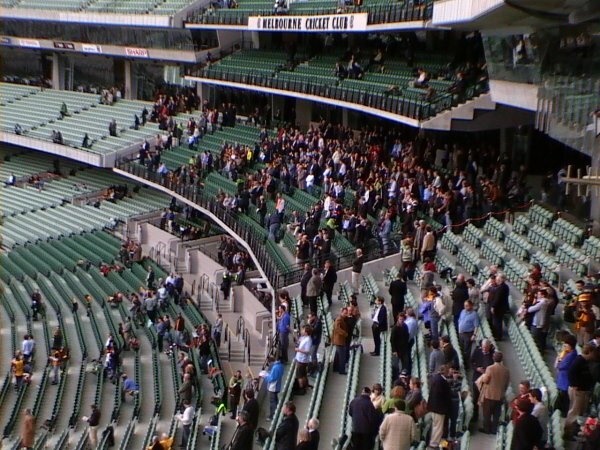 Yes bigger crowds would be good, and maybe there's some umpiring issues which we might discuss later once the dust has settled, but overall the vibe was that it was a great success. I'm curious, did you go to the Grand Final or any other matches?